You have purchased various songs in the iTunes store. As these are coded in Apple’s M4A or M4P format, the titles can normally be played only in iTunes or with an iPod. It’s possible to convert audio files in MP3 format directly from iTunes. For this, you only have to adjust the import settings. Open “Edit | Preferences” command and then select “General” category. Here, click the “Import settings” button. Now in the “Import using” combination field, change the setting to “MP3 encoder”. Confirm both open dialogs with “OK”. Open the media library or any playlist and select the desired title with the [Ctrl] key pressed. Then right click on it and select the context command “Create MP3 version”. For all newer files, this option should work, as Apple is doing away with the old and much criticized DRM protection of its files since some time. If some of the files cannot be converted, it probably concerns older DRM-protected M4P files. Collect these problematic cases in a separate playlist. Then right click to the left of this list and select the context command “Burn playlist on medium”. In the next dialog, make further settings for burning. As the format, select either “Audio CD” or “MP3 CD”. For the conversion process, you will however have to use the expensive disk. 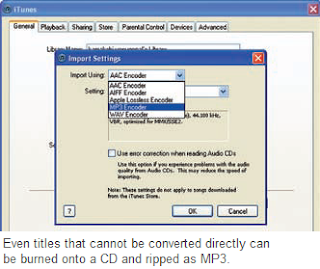 Or you can use softwares like NoteBurner or Virtual CD, to burn a virtual CD without a medium. After the procedure, you will either have an audio CD, a medium with MP3s or the images developed from virtual burning. Insert the disks or mount the images to copy down the music again, or to rip it.